I have submitted an electronic version of my entry. Upload electronic version of entry here. Biography (some or all of this biography may be used in the publication). Upload a document below if necessary. What is significant about the piece you are submitting? I am the owner of all rights to the copyrightable work, images, artwork, or other content (the “Work”) which is attached to this Publishing Release as Exhibit 1 and incorporated herein by this reference. I hereby grant Northern Valley Catholic Social Service (“NVCSS”) and anyone working with or on behalf of NVCSS to publish, distribute, and sell the Diverse Minds North State Journal, the continuing, nonexclusive, royalty-free right (but no obligation) to publish, reproduce, distribute, and sell the Work: (a) in print, electronic, digital, and all other versions and editions of the NVCSS Literary Journal (“Diverse Minds North State Journal”) (whether published under that name or under another similar name), and (b) in marketing, publicity, advertising, and related materials used to promote and/or sell the Diverse Minds North State Journal. I am the sole owner of the Work and agree to protect (indemnify) NVCSS from and against any and all costs, claims, and lawsuits brought by me or any other person which arising from or relate to NVCSS’s use, publication or distribution of my Work as permitted by this Release. I have read this Release completely and carefully and understand its contents and legal consequences. NVCSS’s agreement to consider publishing my Work in the Journal is the only and complete compensation and consideration due to me. Neither NVCSS nor any other person will pay me, or is required to pay me for use of my Work as allowed by this release. I have no legal claim to ownership of or profits from the Diverse Minds North State Journal, whether or not my Work appears in the publication. I understand that the Work may appear on the Internet and in printed form, as well as in other formats, as part of the Diverse Minds North State Journal. This Release does not and will not be deemed to create any employment or business arrangement, joint work, or other legal relationship between NVCSS and me. This Release is a complete statement of the agreement and understanding between NVCSS and me relating to the Work; it replaces and overrules all other agreements or understandings between us about my Work (if any). This Release may be modified only by a written instrument signed by NVCSS and me which states that it modifies this Release. NOTE: By typing your name below, you are agreeing to and accepting the written release above. My submission does not include inappropriate, offensive, or libelous material. My submission is original and created solely by me as an individual. This submission has not been previously published. I have completed the Submission Form and included it with the submission. I have completed the Publishing Release and included it with the submission. My story meets the size criteria: 1,200 words or less; 100 lines or less for poetry; poetry line breaks are clearly identified. 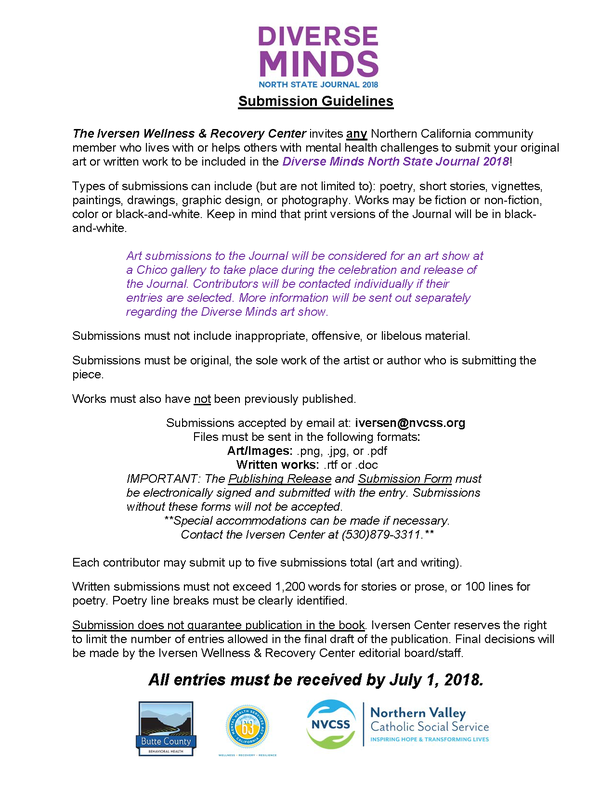 I have submitted by the deadline: July 1, 2018.